Couple of months since my last blog - I have been busy racing, moving apartment (again) and preparing for World Champs! In the middle of May I traveled the length of the country to run for Forth Valley at the Harvester Relay (UK's answer to Jukola). I ran the longest night leg, and made a big lead for the team, which it held to the end. My third victory in the competition, with 3 different clubs! FVO article. The following weekend was the Scottish individual champs at Dalnamein - a really beautiful area (map here). I had a good steady run to win. 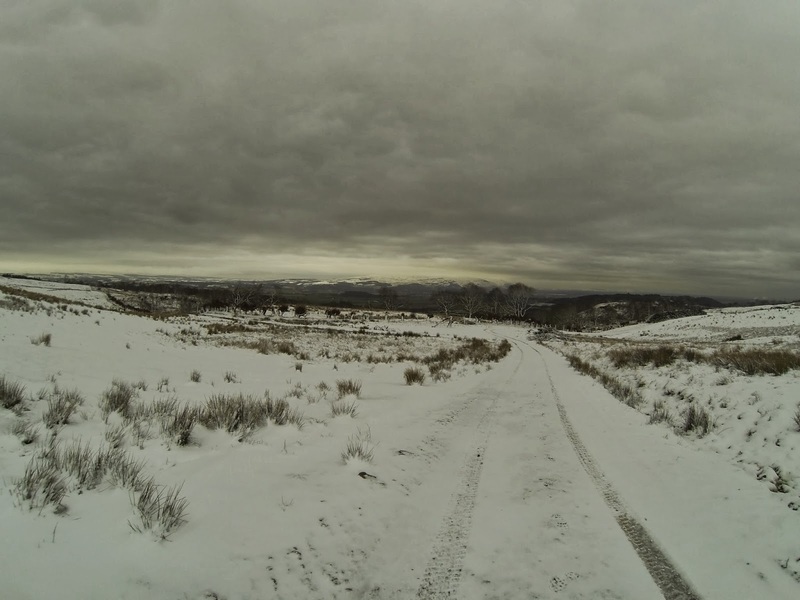 The following day was the relay at Newtyle Hill (map here). I ran the last leg starting 2nd about 2 mins behind Murray Strain. I met him in the butterflies, but he was obviously well ahead. I managed to pull 30s back to take silver for FVO. 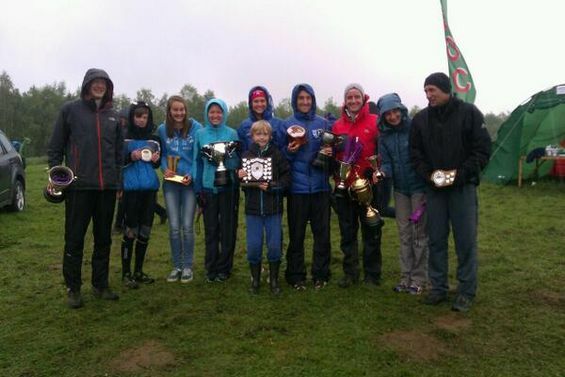 Next up was the British Long and Relay champs in Northumberland. Having previously won two silver medals at the long champs, I was very motivated to finally become "King of the Forest". The race was very long and tough (map here), and I caught several other runners. My performance was quite good, but it was very difficult to run away from the others as it was hard to hit the controls cleanly in the circle. I managed to win in front of Dave Schorah (who I caught 3 minutes) and Hector Haines. In the relay, it was once again a battle against Murray Strain and Interlopers, but this time there were a couple of other clubs (Oxford, Cleveland and Nottingham) in the fight. Map here. I started 5th, right behind Oxford, and I had a good battle with the other 3 (Murray was too far ahead). I was close to Peter Hodkinson in the fight for silver, but a longer forking close to the end gave me too much to make up and so it was a bronze for FVO. 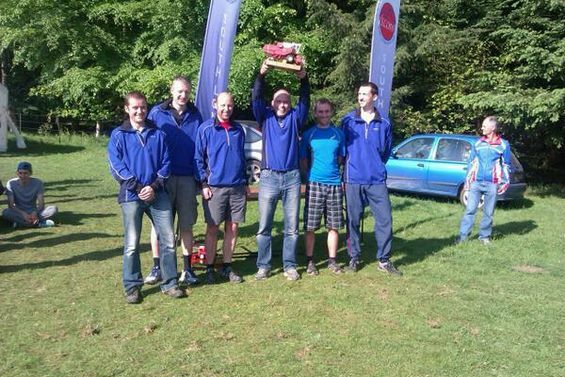 With a 1st, a 2nd and a 3rd, FVO finished 2nd in the UK Relay League 2014 behind Interlopers (who won 3 races!). However, the women managed to win the league! FVO article here. Results. Jukola came at a bad time (as it often does) with regards to work commitments, WOC preparations, and again housing issues. The travel was also very stressful (flying to Stockholm, public transport to ferry terminal and arriving at the ferry with less than 3 minutes to spare). I was meant to run the last leg for IFK Mora, but I really wasn't feeling up to it, so I switched with Artem Panchenko and ran the 6th leg instead. Unlike at Tiomila I had an entirely solo run, with Hans Gunnar Omdal catching me at the last couple of controls. My performance was ok technically, but I had no power and no speed (getting no sleep due to a beach party at our accommodation didn't help). I started 9th and finished 8th (never saw the guy I passed). My time wasn't great compared to the best though which wasn't really a surprise given how my body felt. 11th felt like a bit of a disappointment for the club after 4th at Tiomila, but in retrospect given our preparations and the tough nature of the terrain, we did well to achieve the club's second best Jukola result since the 1960s - more to come though! Preparation for WOC this year, but also for 2015! I have done a lot of training sessions in Scottish terrain, both around WOC 2015 areas, but also in other parts of the country. 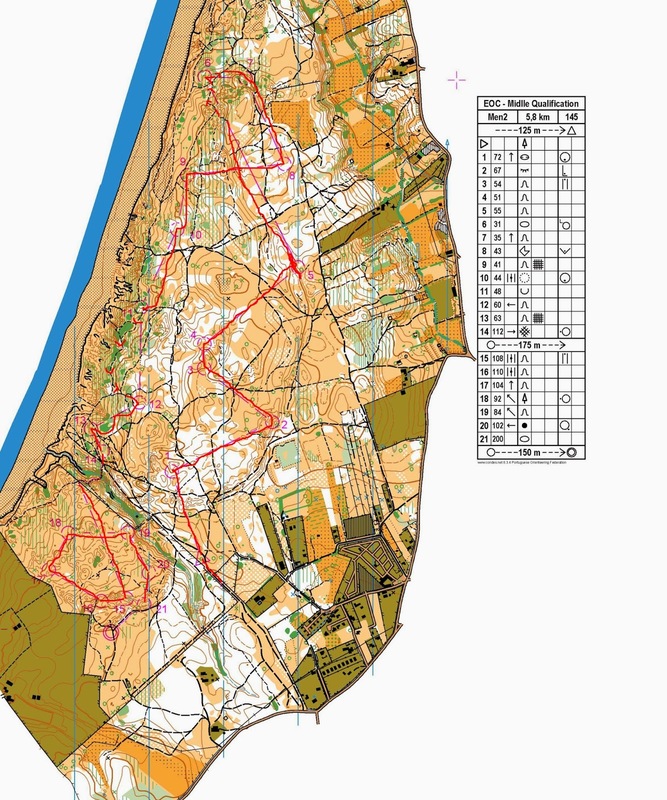 We had a good training weekend after Jukola on some relevant maps with SEDS (Scottish Elite group) including a Scottish O League event at Lossie (always a pleasure) - map here. Then it was out to Italy with some GB and Hungarian athletes to acclimatise for WOC (both to the heat, altitude and terrain!). I will add the maps to my map archive soon, but we did some good training, some good rest and relaxation, and took part in some high quality competition at the Alpe Adria. I took part in the long and middle races. The long went very well (despite the rain and nettles), and I finished second in the WRE which was a good boost before WOC. Results here. Map here (not mine). The middle didn't go so well, but it was a good learning experience! Race The Castles is a week-long festival of orienteering in Scotland this October. Perfect for people wanting to prepare for World Championships in Scotland, or just enjoy some high class orienteering. The week kicks off with races and a ceilidh in Edinburgh and Stirling, then there is free training during the week in Deeside, followed by the JOK Chasing Sprint, a classic race at Balmoral Castle, and a closing event in the sand dunes of Forvie. The Edinburgh/Stirling weekend features the Inaugural UK Senior Home International Sprint. The SHI selectors for England, Ireland, Scotland and Wales will nominate teams of 3 men and women each. Entries will be refunded by RaceTheCastles. The Balmoral/Forvie weekend features the UK Senior Home International (SHI) contested on elite and relay courses. Selections for this event will be done by the respective nations. To allow SHI runners to compete in the WRE, the start list for the SHI will be ordered according to WRE rules. National Teams attending the WOC training camp are invited to participate in the relay on Forvie. We encourage other elite athletes to form mixed-nation teams. Tiomila is generally the biggest target of the year for any Swedish club, and IFK Mora (the club I run for and coach) is no exception. The men were 8th last year and with a stronger team this year the dream was to be top 5. We had very good preparations, and no problems with sickness or injury so we were able to select our strongest possible team. Things went well through the night, with runner after runner doing a really good job to keep us in contention. We were in the lead group after 3rd and 6th legs (the straight legs) which was crucial, and then as things started to split up on 7th leg, Johan Lindberg did a really good job to start me in 5th place. I ran well (tracking here) - only losing time to Thierry - to change over 4th (just behind 3rd and quite close to 2nd still) after 8 legs. Vojtech and Roman then finished the job keeping the 4th place to the finish - the best result for IFK Mora since the 60s! This was the result of 15-20 guys training hard all year, and 10 good performances from those selected to be in the first team. I am now staying in Mora for a few more weeks before going back to the UK for some competitions in the end of May - Harvester Relay, then Scottish Championships, the British Long and Relay Championships. I am happy to announce that as well as the continued support of inov-8 and Hilly, I also have renewed my support deal from Cherry Active and have a new sponsor - Ekens Sportprodukter. Ekens Sportprodukter produces the best magnifiers (lupp) for orienteering that I have tried, and I now carry one with me on every race and every training session. It is invaluable as a tool to use in very detailed terrain when you need a better picture of the map and I highly recommend them. Last week I was in Portugal with IFK Mora, on a preparation camp for EOC. We ran some competitions the first weekend - supposedly the most relevant for EOC, albeit with complex rock detail which will not be the case in 4 weeks. First up was a long distance, and I was pleased to finish 2nd, 2 minutes behind Bergman. He ran 70 minutes, and I had 72 for the 16km course, which gives an indication of how fast EOC terrain can be! It was even quite wet in marshy areas and in the valleys. 2d-rerun of the race here. Results here. I feel a little more confident about tackling the 23km at EOC long distance now. The next day was a WRE middle event, but I chose to take it as a low intensity training. 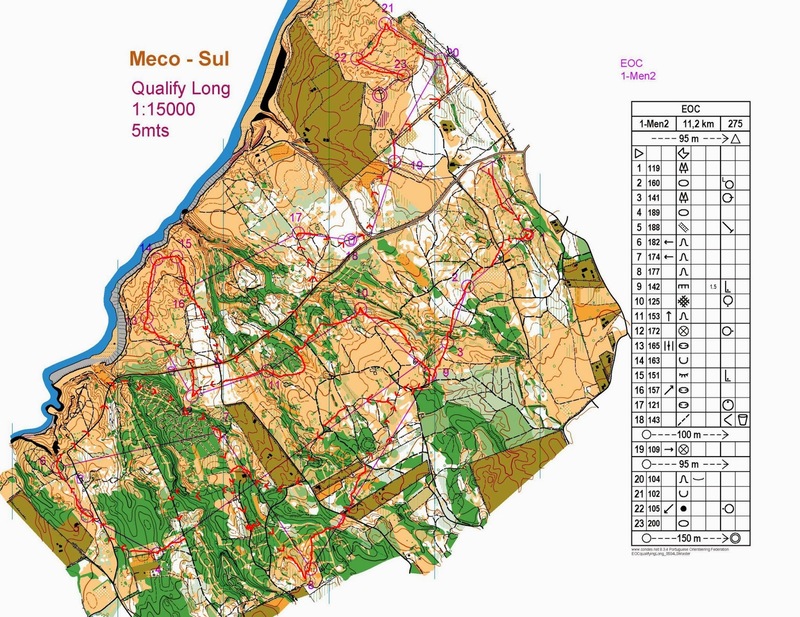 Then we had a fantastic 6 days training around Coruche, with some relay training, some night training - almost all my maps are on my map archive page here. It seems as though I may be able to run both British and Swedish Championships this year after all, as SOFT have changed the SM rules again. I have to check the details, but as I still have a registered address in Sweden and live there for part of the year, I should be eligible to run. I also support the NORD proposal to split WOC into alternate years with urban and forest parts, and to revise the World Cup into something that athletes actually can afford to and want to go to! Proposal here. I also think that there should be qualification races for all athletes to ensure an equal chance for all in the finals, so that there is no 'headstart' for those runners whose federations have money to send them all to the best World Ranking gathering events (such as one-off races costing around 1000euro like the Turkey World Cup?). Countries outside the top 10-15 nations will also be able to develop athletes better, as there is actually a reason to go to WOC other than to just run sprint! Last weekend I won my first British Night Championships (from 2 starts). There weren't a lot of the top guys there, but I did a fairly good race to win by almost 5 minutes from my IFK Mora club-mate Jegor Kostylev. 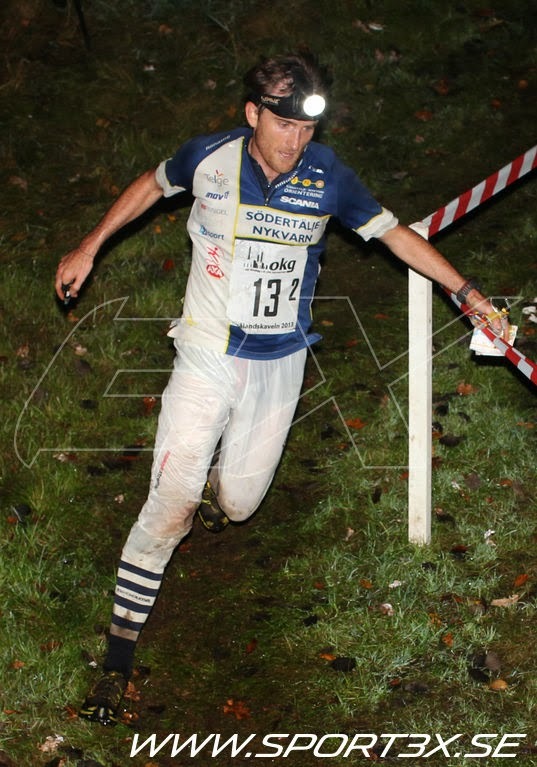 The weekend before I ran the Scottish Night Champs, and finished 2nd, just behind Mark Nixon. That was a scrappy run with many small mistakes, but I really enjoyed the course and the terrain. I also ran the CompassSport Trophy qualification race at South Achray for my club Forth Valley Orienteers, winning in front of Mark and Hector Haines. Maps here and here. Training is going well, but I am happy that I am not competing in Turkey (World Cup) this weekend. Apart from the large financial outlay of attempting to compete in this years World Cup (all races to count, and single race in Turkey, 2 in Spain, 2 in Norway, 1 in Finland, 2 in Switzerland as well as EOC and WOC), the timing is not fantastic. Trying to lay down a good winter base for the long season doesn't mesh well with competing in a World Cup before the end of February. Unfortunately the Spain races fall between the GB WOC test races and the European Champs, so it is already a very intense period even without the extra World Cups. I can't help but feel that the old system of week long World Cup rounds such as those I ran in Italy, France, UK etc around 8-10 years ago were much better designed for the current international elite - one week in the spring, WOC in the summer, and one week in the autumn so that those runners with jobs or without federation support can afford the time and cost to attend. Nowadays the World Cup seems to be Sweden vs Switzerland plus occasional guest runners. Personally I am saving my money to prepare for the World and European Championships as well as I can, and completely ignoring the World Cups for the foreseeable future (unless they fit in with my specific preparation). It seems like quite a few other runners agree!